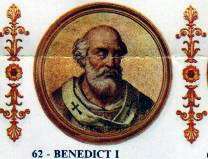 Pope Benedict I (Latin: Benedictus I; died 30 July 579) was Pope from 2 June 575 to his death in 579. Benedict was the son of a man named Bonifacius, and was called Bonosus by the Greeks. The ravages of the Lombards rendered it very difficult to communicate with the Byzantine Emperor at Constantinople, who claimed the privilege of confirming the election of the popes. Hence there was a vacancy of nearly eleven months between the death of Pope John III and the arrival of the imperial confirmation of Benedict's election on 2 June 575. 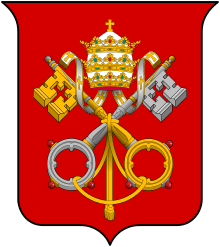 Benedict granted an estate, the Massa Veneris, in the territory of Minturnae, to Abbot Stephen of St. Mark's "near the walls of Spoleto" (St. Gregory I, Ep. ix, 87, I. al. 30). Famine followed the devastating Lombards, and from the few words the Liber Pontificalis has about Benedict, we gather that he died in the midst of his efforts to cope with these difficulties. He was buried in the vestibule of the sacristy of the old Basilica of St. Peter. In a ceremony held in December, he ordained fifteen priests and three deacons and consecrated twenty-one bishops. Few of the records of transactions outside Rome that could help us understand the history of this Papacy survive from Benedict's reign, and because of the disruptions caused by the Lombards in Italy, perhaps few ever existed. 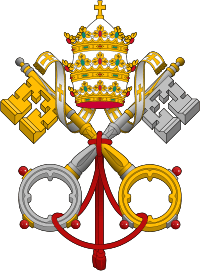 As of 2016, there have been fifteen Popes named Benedict, as well as at least three Antipopes by the name. Some may be named after this obscure pontiff, but most take their regnal name from Saint Benedict of Nursia, the founder of the Benedictine monastic movement. In particular, Pope Benedict XVI stated after his election that he was inspired by Pope Benedict XV, who led the Church through the chaos of World War I, and Saint Benedict of Nursia. 1 2 3 4 5 Mann, Horace K. (1907). "Pope Benedict I". In Herbermann, Charles. Catholic Encyclopedia. 2. New York: Robert Appleton Company. Wikisource has the text of the 1911 Encyclopædia Britannica article Benedict. This article incorporates text from a publication now in the public domain: Herbermann, Charles, ed. (1913). "Pope Benedict I". Catholic Encyclopedia. New York: Robert Appleton.